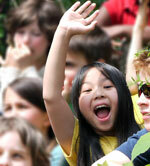 This special day camp will be the highlight of your summer! Camp happens at Wild! Heart Farm & Refuge, with 66 acres of forest, field, streams, and gardens to discover. Learn from experienced Outdoor and Peace Educators as you build community, create nature art, and expand your understanding of the world around and within you. 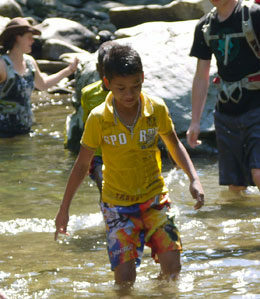 And, when it gets hot, day trips to nearby rivers offer the opportunity to splash and cool off! 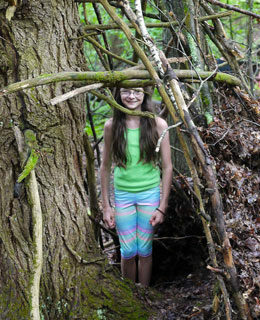 Build earth shelters along Fairy Creek. Climb trees and understand their unique way of bridging the earth and sky. Create a Community with a Culture of Empathy. Explore waterways of the forest. Fire up the imagination with improv and Ecomagic Art. Track the creatures of the earth, water, and sky! Did you know that Birds and Bears have their own way of meditating? Did you know wolves have a peaceable system to restore connection when there is conflict in the pack? Did you know that the whole forest lives in a way to make every plant and creature succeed? Engage Mindful Nonviolent Practices in a safe supportive learning community with internationally recognized Nonviolent Communication trainers to discover how you can be like Bird, Bear, Wolf, and the forest. CELEBRATE THE BOUNTY OF Earth, Water, Fire, and Air! We will celebrate daily with pure spring water and fresh organic food from Wild! Heart Farm & Refuge! We will make yummy international dishes learning about each other’s cultures as well as filling our bodies with great fuel for growing and being part of a healthy life system. Not to mention, breathing in the fresh clean air of the Wild! Heart Forest will oxygenate your blood, bones, and brains! There will be a one-to-six teacher-to-camper ratio so space will be limited. Register early! Campers will be dropped off between 8:45AM to 9AM and picked up at 3:30PM each day at Wild Heart Refuge in Jeffersonville, VT. Each day we will hike, play, make music, tell stories, create art, learn about our connection to the earth, and build incredible earth shelters in the Peace Village by the creek. Once a week we will take a field trip to a nearby river for added adventure and exploration of the Vermont wilds. Throughout, Play in the Wild! Animators (that’s what we call our Team) will offer sessions like Tracking the Inner and Outer Wild, Yoga, Mindfulness, Nature Games, Nonviolent Communication, Improvisation, Nature Art, Storytelling, Swimming, Ropes Challenges, and lots more! On the Thursday evening of Enchanted Forest/Sacred Sky we will host an Overnight opportunity for the kids (who are ready to sleep away) to sleep in tents with us under the stars. On the Thursday evening of Wondrous Water/Fantastical Fire we will host a campfire with a vegetarian supper and storytelling for the kids and their families. Please note there is an additional fee of $35 for the sleep overnight, but no fee for the campfire. WHAT’S SPECIAL ABOUT EACH WEEK? Week 1 – Enchanted Earth/Sacred Sky: Making herbal crafts and Nature art with plants from the land; Tracking and connecting with birds, insects, and mammals that live at Wild! Heart Refuge; Learning the skills of walking in a grounded, connected way to the earth; Discovering ways to spread our wings to be who we are and soar with grace! Week 2 – Wondrous Water/Fantastical Fire: Making Fiery crafts and Water Art; Building Fire to understand our human relationship to this powerful element; Tracking and connecting with creatures that live in our waterways in Vermont; Learning ways to discern when we need to be fluid or solid to know our boundaries and our truth; Discovering our own transformative powers to be who we are with dignity and ease! That’s OK! We welcome students from all over the world! If you and your family want to plan a vacation around this camp, we can provide you with nearby camping and lodging information. We can also connect you to many local hikes, tours, and entertainment, so that you can create a wonderful family vacation. HOW ABOUT MOMMY AND DADDY? We like parents to be nurtured and have fun too! Drop off your kids at camp in the morning, then go off on an adventure of your own. There’s lots to do and see within just a short drive of Wild! Heart Farm & Refuge. Our team can make recommendations based on your interests, including connecting you with local massage therapists so you can have your own mini-retreat days. Onsite, we also offer Nonviolent Communication classes for parents, and serene hiking trails in the surrounding wilderness. At Wild! Kids Camp, we will venture into the magical Vermont wilderness. Each day will incorporate a hike and nature activities, including team building activities and rope challenges. 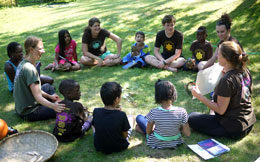 Through hands-on activities, we will reconnect to the knowledge that nonviolence begins with each step on Mother Earth. Wild! 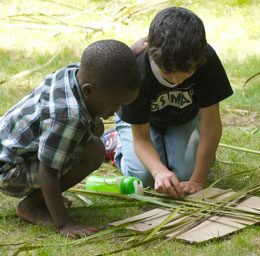 Kids Camp gives children space to grow, laugh, and learn through real experiences of building meaningful friendships. Each day, arts and crafts such as geometry, watercolor, poetry and collage-making will encourage each camper’s mind and heart to rediscover freedom of expression and a natural inquisitiveness about all life. Local, organic, lacto-ova vegetarian snacks and meals will sustain our bodies as well as our minds. We believe that nonviolence starts from within, and is impacted by what we feed our bodies. Throughout camp, we will try fresh fruits and vegetables from local farms as well as explore ideas of mindfulness of what we choose to consume. In the tradition of Play in the Wild!, these will be gourmet, unique, delicious flavors from around the world, especially suited for camp. You will need a day pack or small backpack to carry your things, and a water bottle. Once you are registered we will give you a specific gear list for any day trips we will take to rivers or nearby farms. Play in the Wild! has a tradition of “unplugging” so the good news is that you will not need to bring any electronics to camp! $385 USD contribution includes insurance, materials, all food, transportation and equipment rentals for one week of Wild! Kids Camp, and miscellaneous surprises. Early Drop-Off/ Late Pickup Options: Campers will have a very full day just attending from 9am to 3:30pm, but we offer the possibility of early drop-off and late pick-up to assist families that might need that. Early Drop-Off can be done between 7:45 to 8:45am on Tuesday, Wednesday, and Thursday for an additional $5 each time. Late Pickup can happen on Monday, Tuesday, Wednesday, or Thursday between 3:45 to 5:45pm for an additional $5 per hour per day. You can schedule this in advance. If you are able to contribute more than the requested amount and would like to help make this unique experience accessible to everyone regardless of where they come from, consider making a donation. Your donation can be applied directly towards the Tuition of applicants with limited financial resources. Click on the Sign Up Here! button at the bottom of this page to fill out an online Registration Form. After we receive your Registration Form, a team member will call you by phone or zoom to confirm arrangements for drop-off and pick-up for your child. If you have any questions about the Wild! Kid Camp, including the Registration process, feel free to contact us. We are happy to respond.